From early on man has done opposite of what God has asked of him on how He is to be worshipped. The very first Commandment we are given tells us not to make a graven image or any image of stone, yet when we look around today there are so many images of worship as Buddha, The sacred cow of India, and statues innumerable as man continues to cling to beliefs that are not set forth by God. Shall not God be avenged on a nation that has chosen to turn from Him unto strange gods and idols? (Jeremiah 5:19,28-31). And it shall come to pass, when ye shall say, Wherefore doeth the Lord our God all these things unto us? then shalt thou answer them, Like as ye have forsaken me, and served strange gods in your land, so shall ye serve strangers in a land that is not your’s. They are waxen fat, they shine: yea, they overpass the deeds of the wicked: they judge not the cause, the cause of the fatherless, yet they prosper; and the right of the needy do they not judge. Shall I not visit for these things? saith the Lord: shall not my soul be avenged on such a nation as this? A wonderful and horrible thing is committed in the land; The prophets prophesy falsely, and the priests bear rule by their means; and my people love to have it so: and what will ye do in the end thereof? People truly are as sheep for they follow easily without question why they worship the way they do? We have grown up being taken to an hour service only to return in a week. A WEEK? When Jesus is the Chief Cornerstone of the DAILY church, in His day He taught in the temple DAILY His Fathers doctrine and did not sit to hear their traditions of men………. He was cast out many times and those who follow Him today are treated the same for man wants to stay in the old covenant ways and not accept the truth of the sole purpose Christ came to this earth! To teach us He is the Chief Cornerstone of a Spiritual Church which is a church God has chosen and man has rejected. 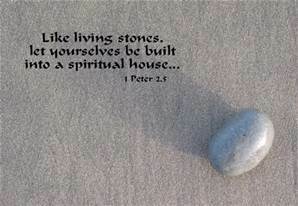 (1 Peter 2:4-10) To whom coming, as unto a living stone, disallowed indeed of men, but chosen of God, and precious, Ye also, as lively stones, are built up a spiritual house, an holy priesthood, to offer up spiritual sacrifices, acceptable to God by Jesus Christ. Wherefore also it is contained in the scripture, Behold, I lay in Sion a chief corner stone, elect, precious: and he that believeth on him shall not be confounded. Unto you therefore which believe he is precious: but unto them which be disobedient, the stone which the builders disallowed, the same is made the head of the corner, And a stone of stumbling, and a rock of offence, even to them which stumble at the word, being disobedient: whereunto also they were appointed. But ye are a chosen generation, a royal priesthood, an holy nation, a peculiar people; that ye should shew forth the praises of him who hath called you out of darkness into his marvellous light; Which in time past were not a people, but are now the people of God: which had not obtained mercy, but now have obtained mercy……….. A TRUE TABERNACLE which the Lord pitched (Built) and not man. (Hebrews 8:2). How many rules and regulations found in the churches of today just as they were in the temple with the pharisees and sadducees! Jesus tried to tell them how on the Sabbath day His disciples were not doing anything unlawful by eating the corn on the sabbath and asked them if they had read what David did when he was hungry and ate the shewbread that was for the priests. (Matthew 12:1-5). The Sabbath was made for man, not man for the Sabbath. (Mark 2:27,28). He went on to teach them a very important lesson of how He was greater than the temple they were standing in! (Matthew 12:6-8). But I say unto you, That in this place is one greater than the temple. But if ye had known what this meaneth, I will have mercy, and not sacrifice, ye would not have condemned the guiltless.For the Son of man is Lord even of the sabbath day. If the word says Christ is not entered into Holy places made with hands I believe it. (Hebrews 9:24). If the word says that by His Spirit we are of the household of God and have access to God our Father by it I believe it. (Ephesians 2:18-22). If the word says we are the temple of God and are His building I believe it (1 Corinthians 3:9,16,17).